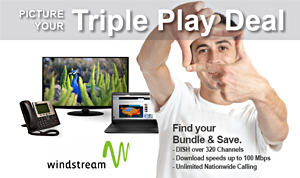 Windstream's Triple Play Package serves up the best-selling DISH America’s Top 120+ plan with viewing options for your entire family, Windstream's Premium Plus Speed Internet 100 Mbps + Unlimited Phone with unlimited local and nationwide calling. Watch your favorite shows live or record them for later with one of the DISH DVR selections. Download speeds of up to 100 Mbps give you the ideal speed for multi-device use, gaming, fast downloading for music and HD movies along with video chatting. Whether your have your family connecting at the same time or utilizing the connection to work from home the connection is more secure and reliable with Windstream. Enjoy your days and nights on-line without the worry of data caps. Phone your friends and family and talk as long as you like with Windstream's Unlimited Phone offering unlimited local and nationwide calling. Windstream’s Premium Plus Speed Internet 100 Mbps gives you up to 100 Mbps download speed available for your favorite online gaming, multi-device sharing, fast downloading for music and HD movies along with video chatting. Your connection is more secure and reliable with Windstream Internet. Enjoy your day and nights on-line with your best-loved movies and gaming without worries of data caps.